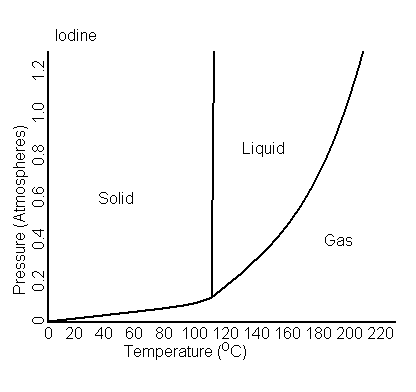 The triple point of Iodine occurs at 0.12 atm and at standard temperature it is a solid on the phase diagram. I understand that therefore, when heating iodine at 1 atm, it (at least some of it) will pass through the liquid phase, and it is also obvious from observing heated Iodine that it yields liquid when heated gradually. Also, just as liquids can evaporate below the boiling point, I understand that some Iodine can escape from a sample in the vapor form when the vapor pressure is lower than the atmospheric pressure. 2) At 1 atm, when Iodine molecules in a solid sample escape into the vapor form, either at standard temperature, or as the sample is heated, do they all briefly pass through the liquid phase first, either at a vapor pressure below 1 atm or as vapor pressure is raised above 1 atm. .
Iodine's crystal vapor pressure will of course be <0.12 atm below the triple point pressure as can be seen on both graphs. A converse but equivalent question would be whether vaporous Iodine at 1 atm can crystalize and deposit without liquifying. It is correct to call the change form solid to gas below the equilibrium vapor pressure sublimation. And there is no separate term for vaporization of a solid above the equilibrium vapor pressure; it is still sublimation. Similarly, a boiling liquid is still perfectly correctly said to be evaporating. At temperatures below the melting point of iodine, it will sublimate until the equilibrium vapor pressure is reached without going through a liquid phase in that process. Once the iodine is heated to it's melting point, it will continue the same process of vaporizing to it's equilibrium vapor pressure. Because it is now a liquid, we just call that evaporation rather than sublimation. If the iodine is further heated to it's boiling point at 1 atmosphere, then it will continue to rapidly evaporate as it boils away. Regarding the thermodynamic relationships between these processes as mentioned in one of your comments (which I think you should just edit into the question), what you have said is correct. 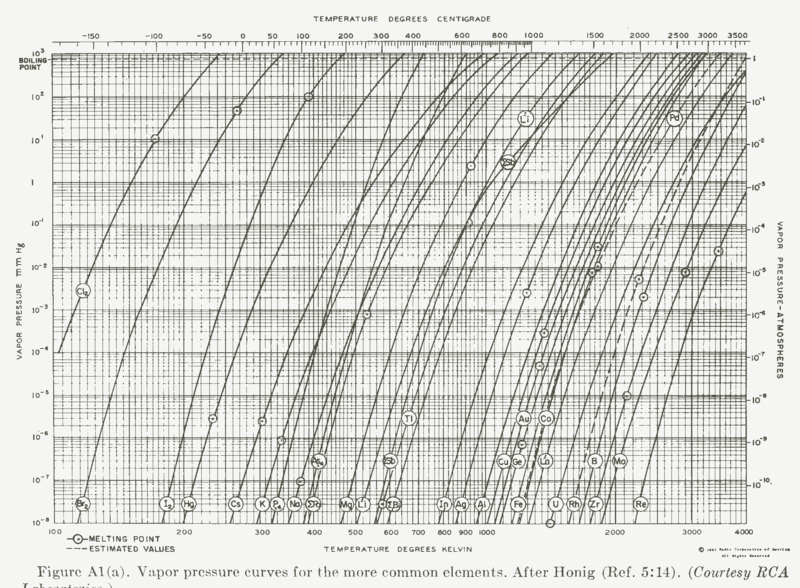 This is a path-independent thermodynamic process, so with respect to the ΔH of the phase-change processes, it doesn't matter how you get from the solid phase to the vapor phase. ΔH for the direct solid-vapor transition (sublimation) is equal to the ΔH of melting plus the ΔH of evaporation. I hope I have addressed all your points, please ask for clarification in the comments if I've left anything unclear. Not the answer you're looking for? Browse other questions tagged boiling-point vapor-pressure recrystallization sublimation or ask your own question. Is this the right conclusion for a thought experiment? The effect of air pressure on the “melting point”? What is the connection between vapor pressure and intermolecular force explanations of boiling? Why don't the solute molecules in a volatile solvent also escape to contribute to vapor pressure?